* 친칠라에게 필요한 규정식으로 디자인되었습니다. * 알파파등 소화건강과 장에 좋은 성분이 포함되어 있습니다. 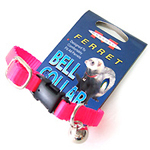 Specially formulated to mirror a young chinchilla's natural diet. 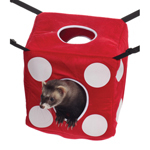 This will ensure that your pet lives a healthy lifestyle. 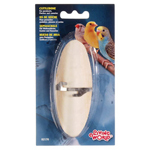 Not recommended feed for adult chinchillas. Fortified with stabilized Vitamin C, A and B12. 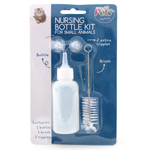 This helps ensure that your pet's health and immunity system are in tip-top shape. 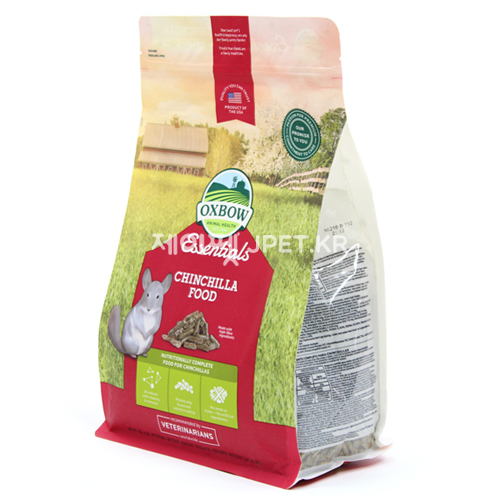 Chinchillas are strict herbivores and a diet high in fiber is essential to maintaining a healthy digestive system. 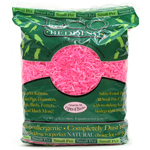 Essentials - Chinchilla Food uses farm-fresh alfalfa hay to provide the fiber content necessary to maintain intestinal health and prevent digestive upset. 전연령용 친칠라 사료로 높은 섬유질이 포함되어 비만을 막아줍니다. 급여하기가 편하고 친칠라의 건강과 활동에 필요한 에너지를 제공합니다. 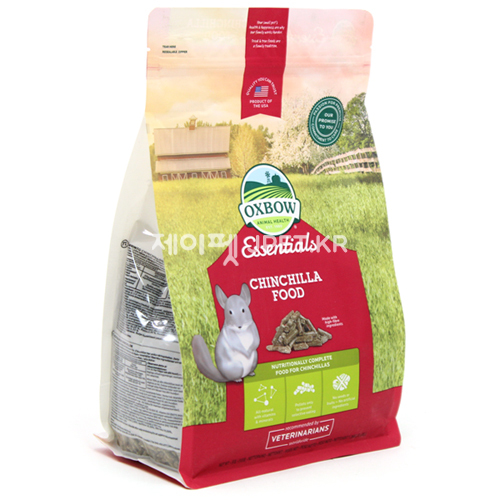 Feed your chinchilla a diet rich in farm-fresh alfalfa with Oxbow Essentials Chinchilla Deluxe Chinchilla Food. 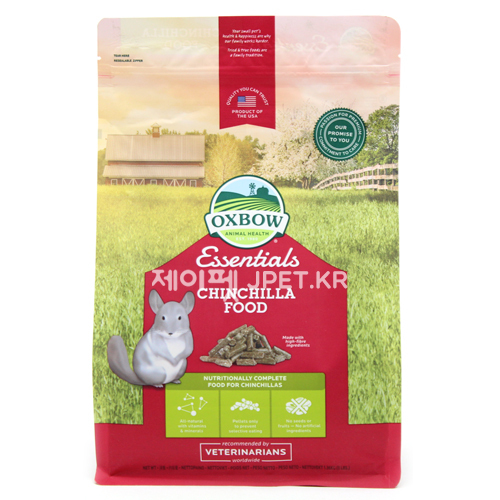 Like other herbivores, chinchillas require daily fiber found in hay to maintain a healthy digestive system. In fact, hay should make up 75 percent of their diet. 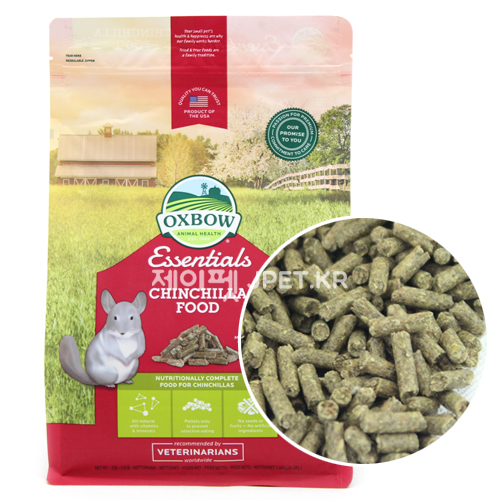 Oxbow Essentials Chinchilla Deluxe Chinchilla Food is an alfalfa-based pellet that is specifically designed to meet the unique nutritional needs of chins. Along with succulent alfalfa, it contains a blend of stabilized nutrients including Vitamin C, Vitamin E and Vitamin B12 for overall health. 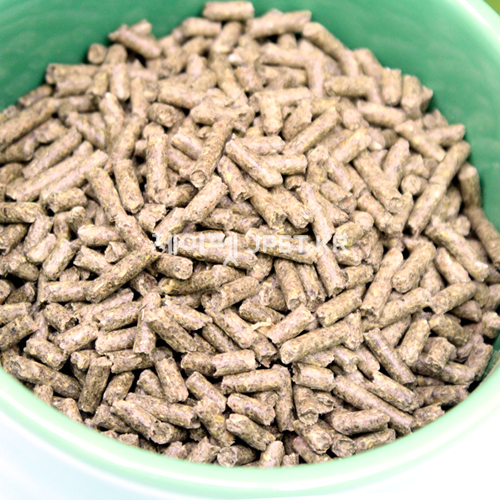 Feed young chins under a year old an unlimited amount of pellets and pair with an unlimited supply of grass and alfalfa hay. 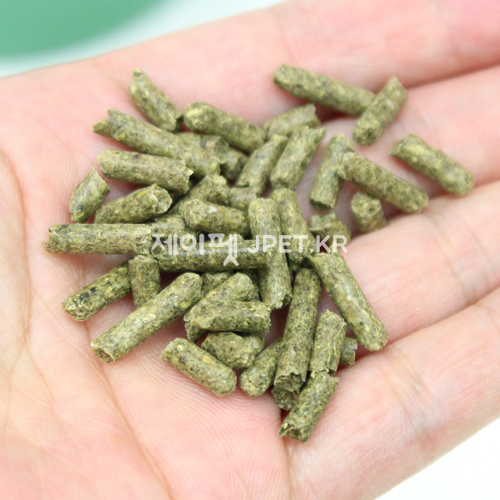 Adult chins should be fed 1/8-1/4 cup along with unlimited grass hay. Alfalfa hay should only be fed as an occasional treat. 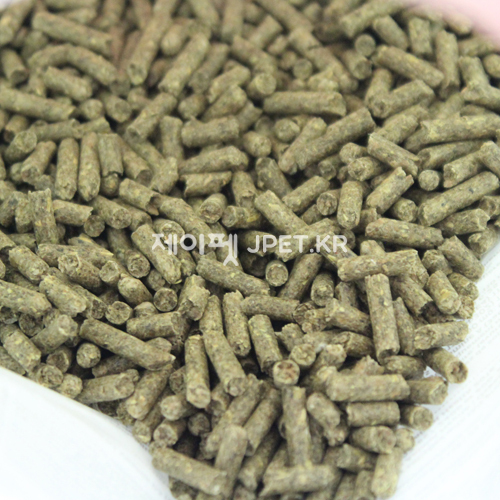 어덜트 친칠라 : 1년이상된 큰 친칠라는 1/8 ~ 1/4컵과 건초를 급여하고 알파파 건초는 간식처럼 가끔 급여합니다. 1주 : Mix 1/4 of 옥스보우 친칠라사료 with 3/4 of the 기존 사료. Feed for 1 week. 2주 : Mix 1/2 of 옥스보우 친칠라사료 with 1/2 of 기존 사료. feed for 1 week. 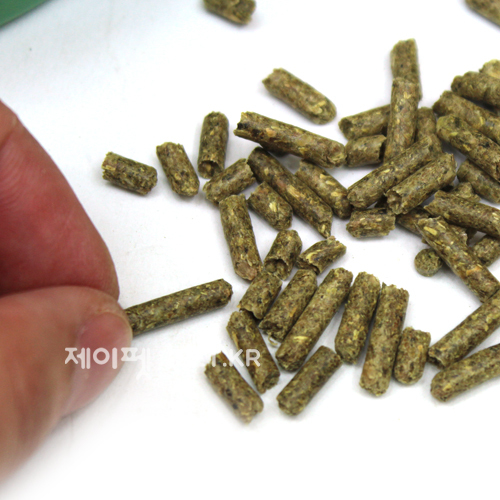 3주 : Mix 3/4 of 옥스보우 친칠라사료 with 1/4 of 기존 사료. feed for 1 week.